My friend and I watched a documentary on roti last week. Everything looked mouth watering, so I vowed to try my hand at making roti at some point during the eat-at-home challenge. Well, today was the day! 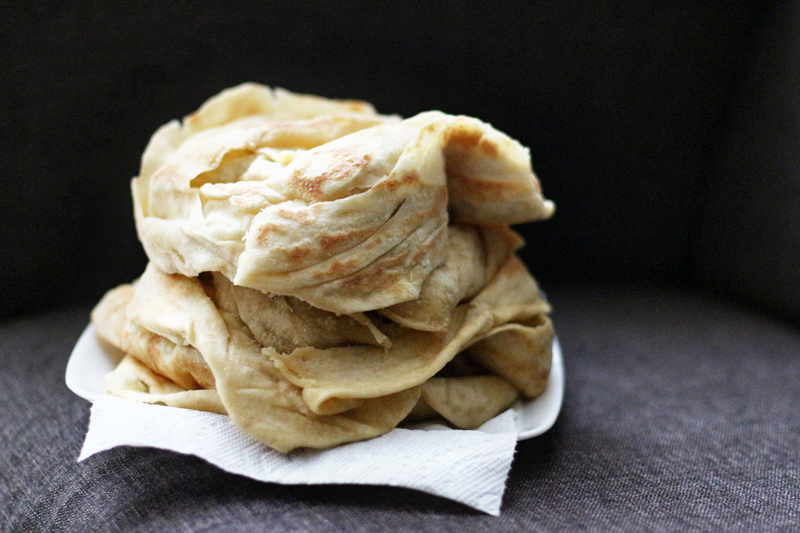 I decided to try making paratha roti, also known as buss up shut, because the end result looks like a busted up t-shirt. I followed this recipe, which was a tad cryptic in parts, but the process ended up being pretty straightforward (albeit time consuming). To accompany the roti, I made jerk chicken from a recipe I adapted for the Instant Pot, rice and peas, and actual peas. That's right, I also made a HUGE pot of rice and peas because I thought the roti would not be enough. After seeing the size of the roti, I asked hubby if he wanted to share one, but he wanted his own "ruffled t-shirt" (as he called it when he couldn't remember the name). So we ate one whole roti each, and now my stomach feels like Alien is about to pop out. Let's just say I'll be halving the recipe next time. The jerk chicken ended up being very salty, but it was perfect with the roti, rice and peas, and actual peas. I can't wait to eat leftovers tomorrow!